According to the “Raising the Game with ABM: 2018 ABM Benchmark Study” by ITSMA and Demandbase, 77 percent of B2B marketers believe ABM has driven greater success for their target accounts. n June 2017, disaster recovery and business continuity software provider Zerto initiated an account-based marketing (ABM) pilot program with its marketing and sales teams. 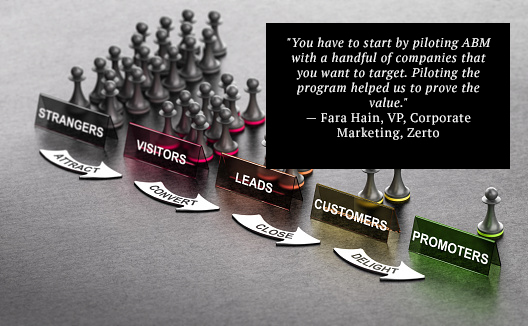 A critical part of Zerto’s ABM strategy was to better coordinate its company’s marketing activities with its sales goals. Founded in 2010 by brothers Ziv and Oded Kedem, Zerto’s conception was driven by the vision that disaster recovery technology should not simply be an insurance policy, but something that could provide a competitive advantage. In 2011, the introduction of Zerto Virtual Replication fundamentally changed the disaster recovery market, setting it on a path of disrupting IT markets and pushing the bounds of what was traditionally thought of as disaster recovery ever since its founding. So when it came to taking risks, Zerto was up to the task. But as Fara Hain, the company’s VP of corporate marketing, freely admits, the ABM program’s initial rollout intentionally flew under the radar. Hain wanted to see what Zerto could accomplish with its agile team of sales and marketing professionals without announcing a full-blown expensive ABM program. She started with nine account reps who each chose five target accounts to work with. Together they mapped each account—building out org charts and making calls to try to get someone to tell them about the company priorities for the year (2017). Next, Hain hired three Account Development Reps (ADRs) to make those calls and work on account plans with the sales teams. She purchased two tools to help the ADRs in the company’s efforts—Engagio and Linkedin Sales Navigator. The tools enabled the teams to follow up on accounts who engaged with its marketing activities and to find the right contacts within accounts. It also employed an inexpensive tool called Listenloop to advertise to specific target accounts online. After the pilot’s successful, and admitted under-the-wire rollout, Zerto opened the program to each account rep in the United States and UK. Each rep chose 25 target accounts for marketing to focus on. In 2018, the ABM program run for those accounts opened up more than $50 million dollars in pipeline. As programs like Zerto’s can attest, account-based marketing can significantly help improve a company’s bottom line. In essence, ABM is really about going back to the basics of sales. It’s similar to what a named account sales rep might have done 20 years ago. The process requires account mapping, understanding the priorities of the account and focusing attention on how to reach the right targets in each relevant account. Today, technology makes the ABM process easier. Started as a key account-focused approach by some pioneering B2B marketers in the early 2000s, ABM continues to help companies win new accounts and grow existing clients of all types and sizes. According to the “Raising the Game with ABM: 2018 ABM Benchmark Study” by ITSMA and Demandbase, 77 percent of B2B marketers believe ABM has driven greater success for their target accounts. The report shows that marketers say their ABM programs now account for 28 percent of their overall marketing budgets. Astonishingly, 45 percent with less than three years of ABM experience in their organizations report at least double the ROI from ABM, as compared to other tactics, the study found. And those with three or more years of ABM under their belts report ABM’s performance is 80 percent higher. It’s easy today—every online advertising tool uses advanced retargeting by tracking cookies and IP addresses and “fuzzy matching” of the data they collect on their platforms. This means you can really get your ads in front of specific people. Make sure you’re using your online ad dollars wisely to target people who have come to your website from your target accounts, and to target your key accounts on LinkedIn and other ad platforms. Direct mail has made a comeback in recent years. You must be creative. Once you’ve determined you have the right target people in an account, sending a gift is visible and yields results. Zerto sent Apple watchbands. After booking a meeting, they received the Apple watch and other teaser gifts to get those key meetings booked. Inbound teams are built differently and may not have the skills needed to book meetings for leads that are mostly cold. The ADR team that Zerto built needed separate tools and focused training to hit their goals. Breaking the two teams (inbound and outbound) was one of the best decisions it made. It allowed the ADRs to focus on getting to the right people in an account, rather than chasing leads that raised their hands (who may or may not be the right targets). Once the marketing machine kicked in, the ADRs got plenty of inbound leads, but they did not rely on those leads alone.